Our annual Two Towns Turkey Trot 5K and Kids’ Fun Run will be held on Saturday, Nov. 17, the weekend before Thanksgiving. This is a great fundraiser for our school that brings people from all over the area together, so please help us spread the word and register today! South Mountain Reservation, Crest Drive/Bear Lane/”Loop.” Directions: From South Orange village, take South Orange Ave. West and make a left just past “The Top.” Follow the signs to the dog park. There is limited parking, so we recommend carpooling. 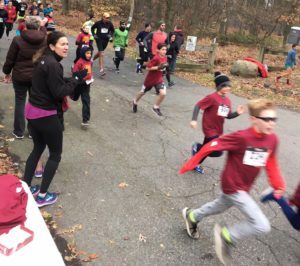 This entry was posted in Community Building, Events, Fundraising, PTA, School, Seth Boyden News, SOMA, Two-Towns Turkey Trot, Volunteer Opportunities. Bookmark the permalink.